This article was printed in The Herald-Times on Monday, December 3, 2018. It is reprinted here with permission. Sycamore Land Trust has helped conserve 526 more acres in south-central Indiana so far this year. The land trust, with headquarters in Bloomington, had its largest land donation ever — 257 acres in Orange County being donated by Martha Barclay-Giel upon her death. Barclay-Giel had already given 10 of the acres in 2004 as down payment for the land located south of Paoli and Pioneer Mothers Memorial Forest. The total acreage is now known as Barclay Woods and had been family owned for more than 100 years, according to John Lawrence, interim executive director of Sycamore Land Trust. Barclay Woods consists of upland forest with karst topography with sinkholes and likely caves underground. There is no parking area or trail on the property and none is planned for the near future, according to Lawrence. The other land acquisitions made this past year are a patchwork of properties scattered in Monroe, Brown and other counties. The land trust’s objective is to purchase land with woods or other natural features worth preserving to help create a natural corridor that, along with state and federal lands, can provide habitat for wildlife and occasionally recreation for people. 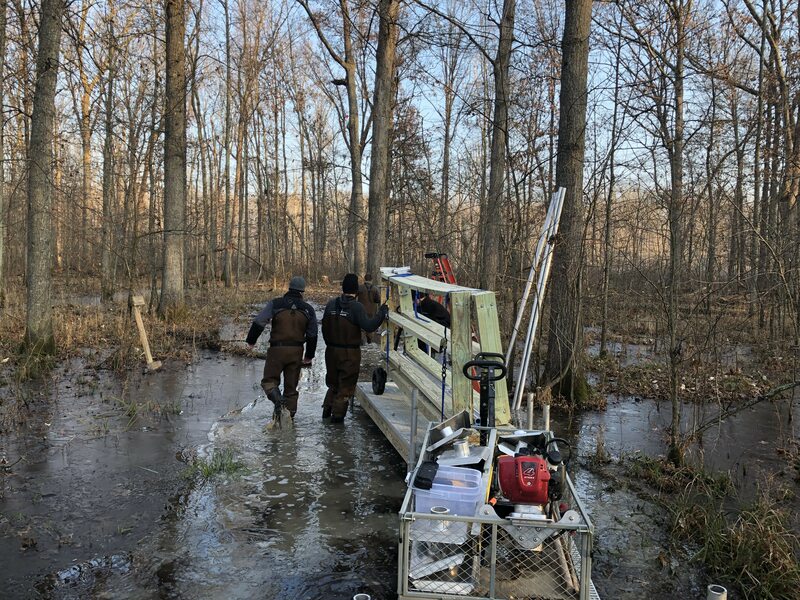 To that end, 88 acres were added to the Beanblossom Creek Conservation Area that follows Beanblossom Creek from the edge of Lake Lemon north and westward to near Gosport. The conservation area was established in 2015 and includes Sycamore Land Trust’s Beanblossom Bottoms Nature Preserve. The new land added includes a 66-acre parcel named Grandchildren’s Woods that had been owned by the same family for decades. The impetus for the name came from the idea of preserving land for future grandchildren — and all people are grandchildren. 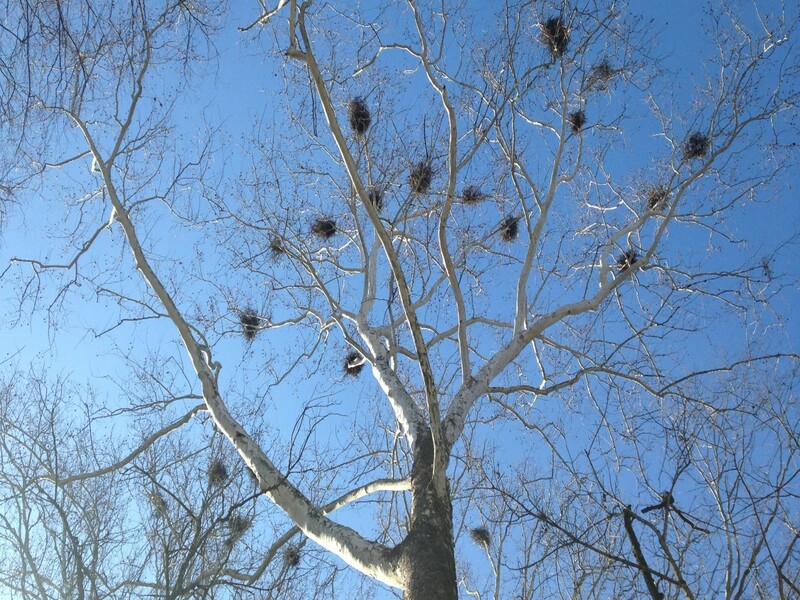 The land is mostly bottomland hardwood forest and has a great blue heron rookery with about 30 nests tucked into treetops along the creek that meanders through the property. Acquiring a property with a blue heron rookery puts a smile on Lawrence’s face. He remembers that the first parcel of land procured for Beanblossom Bottoms Nature Preserve was known as habitat for blue herons. “Twenty-plus years later, we’ve added another (land purchase) with herons,” he said. 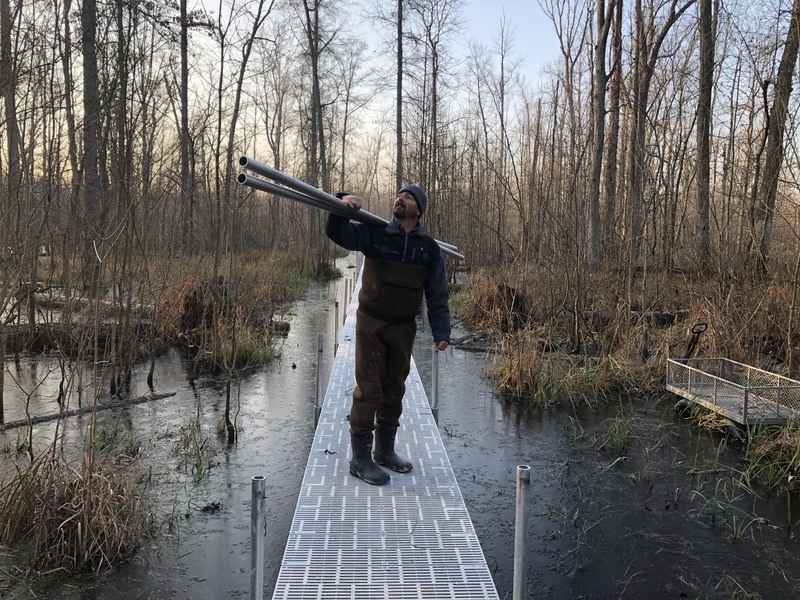 Two other parcels, of 15 and 7 acres, were added to the conservation area this year as part of the Sam Shine Foundation and Dan Efroymson preserves. The 15-acre land is named Kimberlee Preserve after the late wife of Kevin Miller, who donated the land. Another 6 acres were added to the Laura Hare Nature Preserve at Downey Hill in Brown County. While the land trust doesn’t usually purchase small plots of land, Lawrence said this land was a “very key parcel” that filled in a corner of the nature preserve the land trust already owns. Grants from the Laura Hare Charitable Trust provided the funding for the six-acre land purchase and for 84 acres in Pike and Gibson counties that were later donated to the U.S. Fish and Wildlife Service to be included in the Patoka River National Wildlife Refuge.